Used as an ore of copper, a pigment, a gemstone, and a sculptural material for thousands of years. 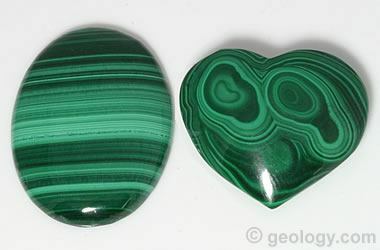 Malachite Gemstones: A malachite cabochon (30x40 millimeter) and a malachite puffed heart, both cut from rough mined in the Democratic Republic of the Congo. This oval cabochon shows the agate-like banding in various shades of green that is typical of malachite. The puffed heart shows concentric structures. 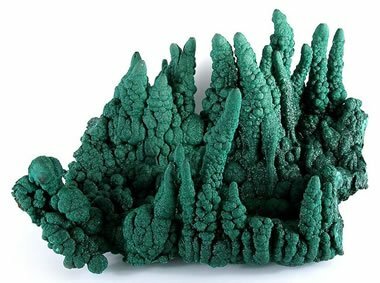 Malachite is a green copper carbonate hydroxide mineral with a chemical composition of Cu2(CO3)(OH)2. It was one of the first ores used to produce copper metal. It is of minor importance today as an ore of copper because it is usually found in small quantities and can be sold for higher prices for other types of use. Malachite has been used as a gemstone and sculptural material for thousands of years and is still popular today. Today it is most often cut into cabochons or beads for jewelry use. Malachite has a green color that does not fade over time or when exposed to light. Those properties, along with its ability to be easily ground to a powder, made malachite a preferred pigment and coloring agent for thousands of years. Botryoidal Malachite: Close-up of botryoidal malachite in a seafoam green color from Bisbee, Arizona. This view spans an area of the specimen about 5 millimeters wide and high. Specimen and photo by Arkenstone / www.iRocks.com. Some of the first malachite deposits to be exploited were located in Egypt and Israel. Over 4000 years ago, they were mined and used to produce copper. Material from these deposits was also used to produce gemstones, sculptures, and pigments. Several large deposits in the Ural Mountains of Russia were aggressively mined, and they supplied abundant gem and sculptural material in the 1800s. Very little is produced from these deposits today. Much of the malachite entering the lapidary market today is from deposits in the Democratic Republic of the Congo. Smaller amounts are produced in Australia, France, and Arizona. Stalactitic malachite: A specimen of stalactitic malachite from the Kasompi Mine, Democratic Republic of the Congo. The specimen is approximately 21 x 16 x 12 centimeters in size. Specimen and photo by Arkenstone / www.iRocks.com. Luster Rare crystals are vitreous to adamantine. Fibrous specimens are silky. Massive specimens are dull to earthy. Polishes to a very bright luster. Diaphaneity Most specimens are opaque. Crystals are translucent. Cleavage Perfect in one direction. Fair in a second direction. Diagnostic Properties Green color, soft, effervesces with dilute HCl to produce a green liquid. Uses A minor ore of copper. Gemstones, small sculptures, pigment. Malachite's most striking physical property is its green color. All specimens of the mineral are green and range from a pastel green, to a bright green, to an extremely dark green that is almost black. It is typically found as stalactites and botryoidal coatings on the surfaces of underground cavities - similar to the deposits of calcite found in caves. When these materials are cut into slabs and pieces, the sawn surfaces often exhibit banding and eyes that are similar to agate. Malachite is rarely found as a crystal, but when found, the crystals are usually acicular to tabular in shape. The crystals are bright green in color, translucent, with a vitreous to adamantine luster. Non-crystalline specimens are opaque, usually with a dull to earthy luster. Malachite is a copper mineral, and that gives malachite a high specific gravity that ranges from 3.6 to 4.0. This property is so striking for a green mineral that malachite is easy to identify. Malachite is one of a small number of green minerals that produces effervescence in contact with cold, dilute hydrochloric acid. 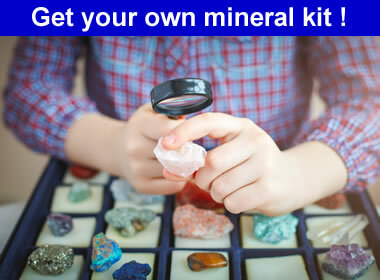 It is also a soft mineral with a Mohs hardness of 3.5 to 4.0. 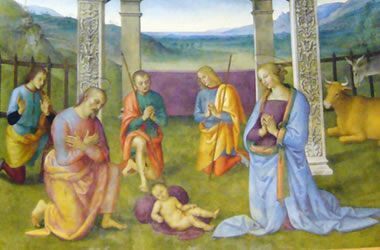 Painting with Malachite: Pietro Perugino (c. 1446-1523) used malachite pigment when painting the green garment colors in his Nativity (c. 1503). He used "Verona green earth" pigment for the grass. The deeper green color of malachite gave the garments a contrasting and more vivid appearance. Malachite Pigment: A photograph looking down into a jar of malachite pigment. 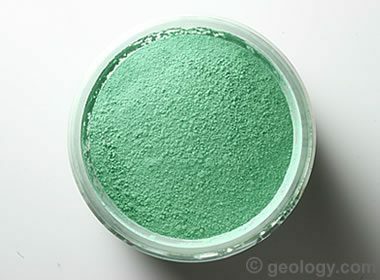 This pigment was produced from malachite mined near the city of Nizhniy Tagil, in the Ural Mountains of Russia. It has a particle size of 20 microns. We obtained this pigment from NaturalPigments.com. Malachite has been used as a pigment for thousands of years. It was one of the oldest known green pigments to be used in paintings. 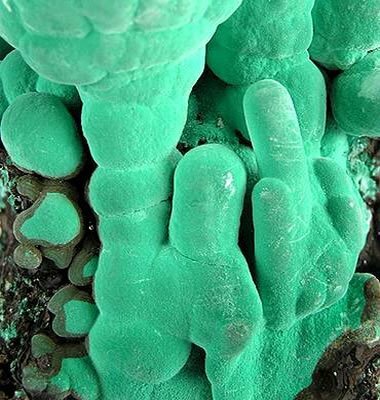 The mineral malachite is an excellent material for producing a powdered pigment because it can easily be ground into a fine powder, it mixes easily with vehicles, and it retains its color well when exposed to light over time. Alternative names for malachite pigment include copper green, Bremen green, Olympian green, green verditer, green bice, Hungarian green, mountain green, and iris green. Malachite pigment is found in the paintings of Egyptian tombs and in paintings produced throughout Europe during the 15th and 16th centuries. Its use declined significantly in the 17th century as alternative green colors were developed. Today, malachite pigment is sold by a few manufacturers who specialize in providing materials to painters who practice historically accurate techniques. Azurmalachite: Cabochons of azurmalachite showing nice patterns of azurite (blue) and malachite (green). They were cut from material produced at the Morenci Mine in Arizona. These cabs were cut from thin vein material and have a natural wall-rock backing. Both cabs are about 25 millimeters tall. Banded Malachite: Two views of a specimen of botryoidal malachite - one external and one internal polished surface. 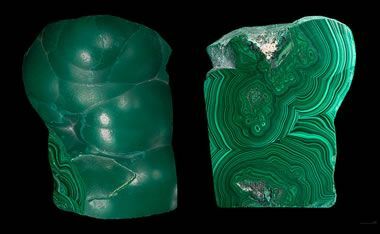 This photo pair shows how agate-like bands and eyes of malachite occur beneath a botryoidal structure. This specimen was collected near Katanga, Democratic Republic of the Congo. Photograph by Didier Descouens. Used here under a Creative Commons License. The vivid green color, bright polished luster, banding and eyes of malachite make it very popular as a gemstone. It is cut into cabochons, used to produce beads, sliced into inlay material, sculpted into ornamental objects, and used to manufacture tumbled stones. Small boxes made from slices of malachite are attractive and popular. Some of the most spectacular gem-quality malachite involves intergrowths, inclusions, and admixtures of malachite with other copper minerals such as azurite (azurmalachite), chrysocolla, turquoise, and pseudomalachite (eilat stone). Malachite's use as gem and ornamental stone is limited by its properties. It has perfect cleavage and a Mohs hardness of 3.5 to 4. These limit its use to items that will not suffer abrasion and impact. It is also sensitive to heat and reacts with weak acids. These properties further limit its use and require care during cleaning, repair, and maintenance. Malachite is sometimes treated with wax to fill small voids and improve its luster. Synthetic malachite has been produced and used to make jewelry and small sculptures. Poorly done synthetics are often recognized by their unnatural color. The better synthetics can usually be recognized because their banding and eyes do not have a natural geometry. An experienced person can identify most of the synthetic and imitation materials on sight.